Arab community resists in Chicago suburb | Fight Back! Fight Back! : A year ago, a Republican elected official in a heavily Arab area of Chicago’s suburbs insulted Arabs and Muslims, and an uproar has continued in that community. Who is this Republican? What were the racist statements that caused this uproar? Bassem Kawar: Sharon Brannigan is a Palos Township trustee, and a former representative on the Cook County Commission on Women’s Issues. She was forced to resign from this commission two months into our campaign. The comments that surfaced a year ago included unfounded allegations that the schools in the township are filled with undocumented students of Middle Eastern origin, a dangerous statement in this country today, when undocumented families are under attack, and while anti-immigrant biases and racism are the norm of Trump’s domestic policies. Her comments went so far as to assert that women who wear the hijab are “undignified,” which she wrote when Melania Trump visited Saudi Arabia without wearing the headscarf. Fight Back! : How has the Arab community responded? Kawar: We immediately convened a meeting that included community-based organizations, Arab community members, and other residents, and went right to work. Our first response was to call for her resignation, but we knew we had to also build a sustained campaign. The Campaign to TAKE ON HATE, along with its partners at the Arab American Action Network (AAAN) and Family Services, led the newly built coalition, which began its organizing by administering a petition calling for the resignation, visiting local mayors to demand that they commit to inclusivity in their villages, and canvassing dozens of homes and over 100 businesses in the township. The campaign we are running, and the platform we are creating, is turning traditional electoral politics on its head. We were very intentional in providing an inclusive platform to engage youth, undocumented immigrants, and other non-citizens in our campaign, by calling for the removal of an elected official from office vs. calling for the election of an alternative candidate. TAKE ON HATE trained over 50 volunteers in door knocking, canvassing and phone banking - community organizing hard skills that we believe are essential in continuing the base and movement building necessary to challenge white supremacy in the era of Trump. 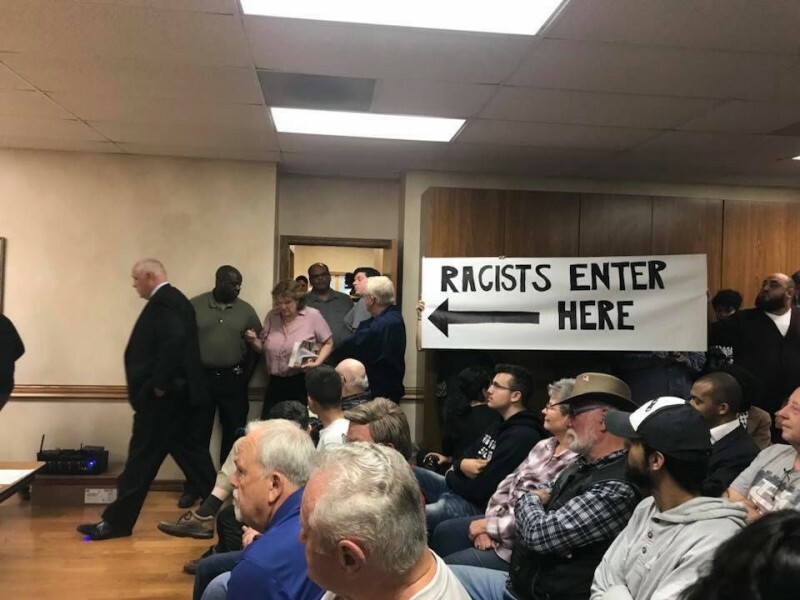 We believe that the only way to defeat white supremacy and racism is by confronting the racists, and we have demonstrated this by rallying at and protesting every single township meeting in the last year and by picketing in front of Brannigan’s flower shop on Mother’s Day weekend. Our efforts have been led by the community and will continue to be led by the community until we win the resignation and real accountability from the Palos Township. Fight Back! : What are the objectives of the movement? Kawar: The movement is demanding the immediate resignation of Brannigan, a call that we believe will deliver a material and tangible blow to the right wing and white supremacists. We are localizing the struggle against white supremacy, as well as sustaining our community’s organizing momentum from the protests of the first Muslim Ban, the airport shutdowns, and the one-day bodega strike led by Yemeni women in New York. Fight Back! : What has been Sharon Brannigan response, and the response of the Republicans in Palos Township? Kawar: Brannigan’s response has been the traditional response of racists. She immediately hid behind the First Amendment, claiming that she had the “right to free speech.” We believe in free speech, of course, but completely reject the notion that racists should be allowed platforms for spewing hate against our or any other community. We rejected this ‘apology’ because it was insincere; a case of too little, too late; and clearly an example of political expediency. We had asked for it months before, and she refused to budge. So she decides to apologize months later, just to try and salvage her political career? No, that’s not acceptable. The Republicans in the township, including the top dog, Cook County Commissioner Sean Morrison, have either supported Brannigan, or remained silent on the issue. We do not expect anything else from them, but did organize a call-in week to demand Morrison to speak out. Fight Back! : Are there incidents like this in other parts of the country? Kawar: Not exactly with the same level of organizing and community mobilization, but there was a post-Trump election incident in Kalkaska, Michigan, where the mayor called for the killing of “every last Muslim” on his social media. This is the alarming reality of where we are, and where we are still headed, in Trump’s United States. Fight Back! : What are the lessons of this? Kawar: The main lesson is that racism and white supremacy must be confronted head on. We know what it looks like, and we know what it sounds like, so we cannot allow it to continue to infect U.S. society. This is why we challenge Brannigan directly and call on others to do the same when their elected officials, media personalities, or other public figures spew racist hate. And to defeat this racism and Trump overall, we must continue to build our alliances with the most affected and impacted communities (Black, Latinx, Native American, Asian, women, workers, LGBTQIA, and other oppressed people), and together establish platforms that will advance our political understanding and activism in the broader social justice movement in the U.S.